← Why is Dust Control Important ? Dust Control – What Are You Buying Exactly? It occurs to me that most County Road Commissions and their Townships are purchasing Dust Control on good faith. In my experience at MDOT, no materials, services or parts were purchased without a written specification in place at the time the contractors were bidding. I see the same for Counties and Townships, with the exception of Dust Control. In reviewing recent bids, the majority have no specific requirements to ensure that the agency is getting what they’re paying for. When a Road Commission purchases grader blades, asphalt, gravel and emulsions, specific quantities, types, gradations, material content are all spelled out. When it comes to Dust Control, honesty is the best policy. No analytical follow up, most cases, are required for loads delivered or placed. I am still confused as to how some mineral well brine suppliers come up with their “26%” solution number. If you look at their test results, the hygroscopic material, Calcium Chloride is as low as 17%, never higher than 21.5%. Magnesium Chloride at 3% – 4%, and Sodium Chloride @ 4% – 6%. So when you do the math, there can be anywhere from total content of 24% – 31%. Each load can vary by 3% to 7%. An even bigger issue is what is in the product you are paying for? Calcium Chloride is the work horse; it is what keeps the fines in place, dust down and maintenance cost low. Any Mineral or Oil Field sales person that shows up at your door will compare their product to LIQUIDOW* 38% Calcium Chloride, the best product on the market, on this point we all agree. Mag Chloride at less than 20% is no more effective then water and – this is a big and – Sodium Chloride (salt) actually adds to the dust problem. In its natural state, salt is a solid, it returns to a solid as it becomes dry. Just think of the highway after the big snow storm, remember the dust? That is salt on the road that wasn’t diluted; it then is blown around by traffic, in to the ditches and waterways, into homes. What impact does this have on residents with breathing problems? What impact will this create in the future for our lakes, streams and drinking water? At the recommended application rates, mineral well brines put more than one-ton of salt in the environment for every mile of road, times that by the number of applications per year, more salt goes into the air, lakes and streams, than during the winter on paved roads. Oil Field Brines have been tested at over three times the Sodium content. The DNRE is reviewing current permits of this type of brine and looks to be categorizing it with Oil Field Brine for these very reasons, trying to reduce the environmental impact. The next major consideration; contractors will honestly tell you they store their product in large lagoon type ponds. Some of these are up to 1.5 acres and hold over five million gallons of product. As I look out my window, I am watching the rain come down; we are in an incredibly wet spring, over 3 inches of rain in 3 days. This got me thinking, how much water would that add to one of these storage lagoons? Some quick research shows that each inch of rain over one acre equals over 27,000 gallons of water, times 1.5 acres = 40.500 gallons. 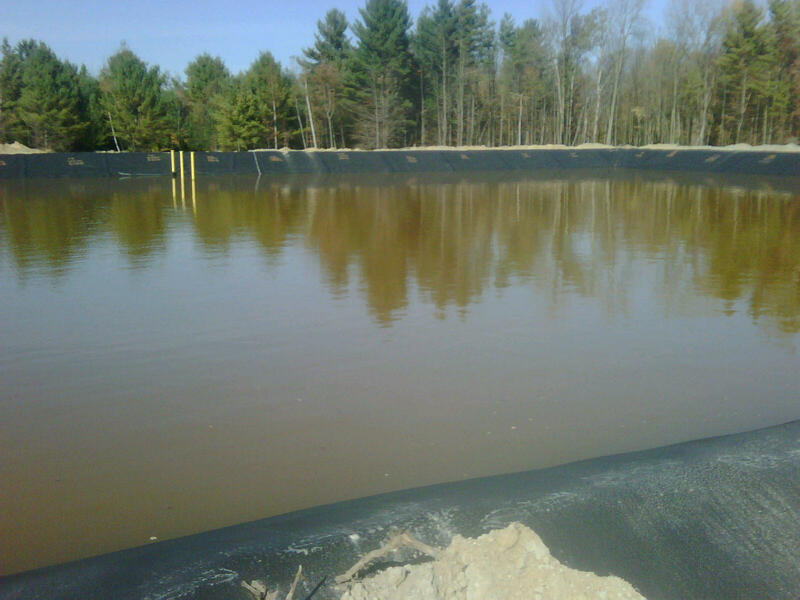 Then multiply that by 3 inches of rain equals 122,000 gallons of water added to one of these storage lagoons. So, this begs the question. How diluted will the customers material be? There have been claims that you can evaporate the water. If it is truly a hygroscopic material as claimed, it draws moisture, it can’t work both ways! Unless you’re inspecting loads or requiring samples from each load for random analytical testing, chances are you’re going to have dust problems, you will lose fines in the aggregate, the road will deteriorate at an accelerated rate and you’re already tight budgets will be spread even further. When purchasing LIQUIDOW* Calcium Chloride for snow & ice or dust control, quality control measures are in place ensuring that every load of product delivered is what you specified. We test it, we sample it and we ask that you sample and test as well. I would go as far as to suggest that when bidding Dust Control, require that 26%, 28% or 38% be within +/- 1% of the percent of the percentage bid. That it be of the “primary constituent”. In other words, if you are paying for Calcium Chloride for Dust Control, you should be measuring for Calcium Chloride. Total Chlorides don’t get the job done. Sodium actually works against what you’re trying to accomplish. We would be more than happy to help you design a specification that will protect your interest and save you money in the long run. Please contact us with your snow and ice, or dust control questions. Vice President of Product Development and Marketing, Great Lakes Chloride, Inc. Serving Michigan, Indiana, Illinois, Ohio and Kentucky. Retired Michigan DOT, October 2010 after 32 years experience in Maintenance/Operations. Specializing in winter operations and liquid de-icers and anti-icers. This entry was posted in Dust Control. Bookmark the permalink. 8 Responses to Dust Control – What Are You Buying Exactly? What should a homeowner do for dust control if they live on a dirt road where nothing is done except an occasional grading? Are there other products that are better/longer lasting than calcium chloride? We haven’t found a product that works better or last longer then Calcium Chloride for dust control. There are a couple of options that may work for you. 1) Some County Road Commissions offer “spot” dust control that home owners can pay for themselves through the road commission. This is bid for the entire county and helps keep prices down. I don’t know if this is available for your area. 2) Local landscapers offer Calcium Chloride dust control treatments as needed by the home owner. Not sure of your area or availability. 3) A do it yourself method that I have used on my own property in Northern Michigan, is to dampen the road in front of your home with a garden hose or sprinkler. Best done during non-peak traffic times, later in the evening is best I have found. Then purchase bag calcium chloride, this can be purchased from your local Lowe’s. Home Depot or Menards. This time of year you may have to ask for it. Then use a lawn broadcast spreader for fertilizer and spread the flake on the roadway. Just enough so it looks like a light snow on the road. The moisture will help activate the calcium chloride and this will work well for dust control. It’s not an exact science this way and you may have to do once or twice more for the summer season. But for the do it yourselfer, it does a good job and keeps the dust down at a very reasonable cost. Thanks for the question, good luck. I’m searching the net regarding dust control and I’m lucky I found your blog. It is very informative. Thanks for sharing! Thanks for the kind words. If there is anything specific you would like to see or questions, please let me know. Hi Dave: I am trying to make CaCl2 brine and am having trouble finding the mix ratio. I make up 1000 gallon batches of Salt brine with 1 ton of salt to get a 23.5% solution. The only Calcium chloride I can get in my area is 77% flake. I mainly use this for deicing, and want the Calcium Chloride brine for when it gets colder. I have also toyed with the idea of adding x% of Calcium Chloride to my 23.5% solution of Salt brine. Was also thinking of adding just before application as the exothermic reaction creates heat which is a good thing when deicing. Thanks in advance for any light you can shed on this subject. Great Question, Sorry for delay I had to do some research myself on this one. The 77% dry flake you are finding is not from Occidental Chemical, they manufacture 84% dry flake or pellets. So with that said, a mixture of 450 lbs. of 77% CaCl2 with 77 gallons of water will make 100 gallons of 32% calcium chloride. It would weigh 11 Lbs. per gallon. 32% is the best deicer for cold weather de-icing. We are successfully mixing 32% Calcium chloride to the 23% salt brine at a 80/20 blend. We have the most experience with the BOOST* inhibited product, but if you don”t plan to store for long periods of time without agitation, the straight 32% will work fine. We do have a calculator on the Oxy web site that will get you in the ball park with the 84% Dry flake as the benchmark. You can then look at the chart for specific gravity and add dry to your liquid to make the mix you are looking for. You make have to copy and paste the address to your broswer. Please let me know how this works for you. Best of luck and be safe out there. Thanks Dave: Your calculations confirm mine, there are a lot of people on line giving inaccurate information. For your information Dave I am having a lot of success with a 10% by volume “98% pure” dry Calcium Chloride added to my 23.5% Na Cl Brine. It heats up the total brine product, turns it white and frothy, and works grate. I still haven’t done freeze testing on this to find out the temperature ranges that it works at. I add and mix just before application. Thanks for sharing you information with us Dave. Gathering Deicing Information by Storm Event!